ANTONIO BLANCO | Geringer Art, Ltd.
Don Antonio Blanco, also known as Antonio Maria Blanco, was an artist of Philippine/Catalan descent. He was born on September 15, 1912 in the Ermite district of Manila. Both of his parents were Spanish, a fact that Blanco later believed linked him geographically and spiritually to Miro and Salvador Dali. After becoming an American citizen he studied painting at the National Academy of Art in New York under Sidney Dickinson. Following travels in Hawaii and Florida, he came to Bali where he gained recognition as an eccentric and outlandish character and painter. The style of his work evolved over time from Realism, to Impressionism to Romantic Expressionism. Blanca’s brushwork was fluent and fluid. Blanco learned from the style of Willem Hoftker, and went on to create daring, sensual images of bare breasted Balinese women. 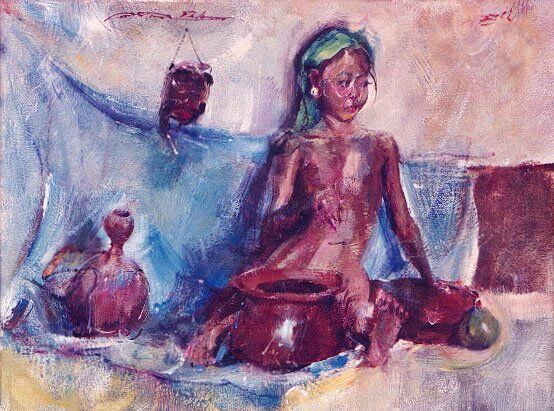 Women are the focal point of his paintings and one could say that he has been called a painter of the “eternal feminine.” Blanco became a favorite of Jakarta society, and his art was very much in demand. In 1952 Blanco married a Balinese model and dancer, Ni Ronji in 1953 who became his muse and model. Living in serene surroundings with his four children, Tjempaka, Mario, Orchid and Maha Devi, Bali became Blanco’s center. He also visited Cambodia where he was a guest of Prince Sihanouk. Blanco spoke six languages: Spanish, French, English, Tagalog, Indonesian and a bit of Balinese. He lived, until his death in 1999 in his home and museum in Ubud: The Blanco Renaissance Museum. More than 300 works by Antonio Blanco are on display, shown in chronological order to illustrate his artistic development. They are displayed in frames of the artist’s own design, on brightly colored walls. Many notable individuals have owned and collected Blanco’s paintings, including the actress Ingrid Bergman, Mexican telenovela queen Thalia, (Ariadna Thalia Sodi Miranda), Sukarno (the first President of Indonesia), Suharto (the second president of Indonesia), the former Indonesian Vice President Adam Malik, Prince Norodom Sihanouk, and pop star Michael Jackson.